What a place - yes, it is big complex, with over a thousand rooms and it is more like a holiday village, but there are plenty of places to get away from other holidaymakers. I have recently returned from Jaz Aquamarine, spending a week over the Easter period through TUI Holidays, who rate this place as a 'Platinum' hotel. And it certainly is that - a magnificently landscaped complex around 18 pools of all sizes and for all tastes. 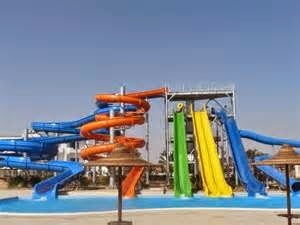 Children have their own water space, including three sets of water slides discreetly placed around the complex. Babies have shallow ponds, well covered from the sun and where parents can keep an eye on them. You can even book a 'pool room' from which you can fall out of your bed and step into your own swimming pool outside your ground floor patio. We frequented one of the larger adult pools near the 'beach' - more a slab of concrete laid out to get the wind-surfers out in the blue waters of the bay. I could not see any sand, not that it bothered us! We booked a standard room with balcony (below), overlooking the adult pool and it was beautifully cleaned and maintained by our chamber-man. 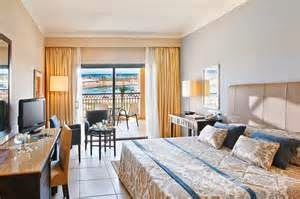 Towels were changed everyday and bottled water and the minibar refilled regularly. The whole place is spotlessly clean and the gardens and lawns are impeccable - gardeners and cleaners are diligently maintaining the place day and night. This resort is expensive, but as I always say, 'you get what you pay for'. There are certainly plenty of Russian holidaymakers appreciating Jaz and after English and German, the Russian language is the third spoken and occupying notices and signage around the complex. 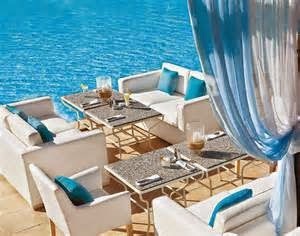 Most visitors are on all-inclusive packages which include free 'local' drinks, three meals per day and endless snacks. We found the food variety and quality at breakfast and lunchtime very good, but as late diners in the evening, we found some of the 'held-food' only just warm after 8pm. There was no evidence of this food being regularly 'probed' by chefs to check its temperature. (See my blog:- 'Food or Technology?) As for the Pharaoh's drinks available as part of the all-inclusive package, the draft Egyptian wine was poor and the local spirits hardly alcoholic, however the beer was good. Waiter service was acceptable, but not as good or as friendly as we have found in Tunisia. I give good tips, but it seemed to make little difference to the attention or service that you receive from food and drink staff. They all seemed very pre-occupied with clearing tables, than serving you. (Sometimes your food or drink was removed while you were still consuming it!). As for the reception staff - rather austere, I felt. I was told on three successive occasions by reception staff, when I made a request for help, to ''come back tomorrow''. I gave up! 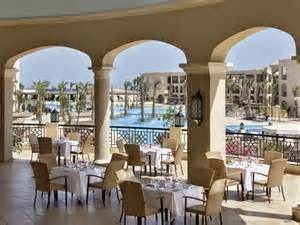 We managed to secure a booking in the hotel's Lebanese restaurant on one of our evenings and the food and service was outstanding. Generous starters of pitta bread with a range of hummus, cheese wrapped in vine leaves and dips were followed by a choice from mains that included chicken skewers and mixed grill. Beautiful Lebanese desserts completed the menu. If the other three specialist eateries are like the Lebanese, then they are all well worth a visit, if you can book them! The food there is part of the all-inclusive package but they try to sell you better wines - I succumbed to a £40 bottle of French white - it was good but not that good! I have probably been hyper-critical of Jaz Aquamarine - it is a great relaxing and very clean holiday hotel in a beautifully warm and sunny country! Don't be alarmed that the US and German Governments are currently advising their citizens not to travel to Egypt, due to the country's unstable political situation. That may well be the case if you are considering a trip to Cairo or Alexandria and I have an Egyptian sister-in-law who has advised staying away from the Egyptian capital at the moment. However, I found Hurghada to be a safe place for tourists, and the only evidence I saw of any instability were the armed soldiers at the approaches to Hurghada airport.